Mrs. Mintita Nitikornkulanun(4thfrom right) , Business &Marketing manager 121 Creation organizer &Publisher and Mr. Kriengrai Thiennukul (Middle),Vice chairman of Trade Investment Promotion, Business Council and. F.T.I. ASEAN Center Thailand and representatives from relevant associations attended the opening ceremony of three big print exhibitions – The 6th Printech &LED Expo 2018 , The 3rd Garment &Textile Embroidery Expo 2018 and The 1st Printing &Packaging Expo 2018 .The three shows are the biggest the gathering of operators in the groups of Printing business such as inkjet printers, digital Printers, Packaging Printing, and Services-related Business -billboard, Business of printing work, equipment for printing and the Led business for example. 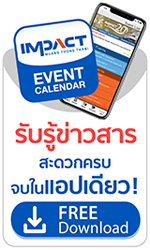 Scheduled for March 1-4, 2018 at Hall 5-6, IMACT Exhibition Center, Muang Thong Thani, The 4-day shows feature over 200 companies and are expected to attract more than 20,000 visitors.